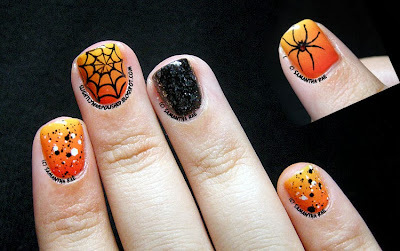 Slightly Nail Polished: Halloween Spiders! As promised, I have my very first 2013 Halloween design for you! This is my favorite time of the year for nail art. I wait all year for it and I can't believe it's here already. But I'm so excited to share some of the designs I've been planning all year to do. So let's get the season started with some icky spiders! 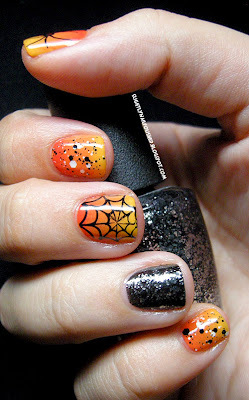 Nothing screams Halloween to me more than a good combination of orange and black. 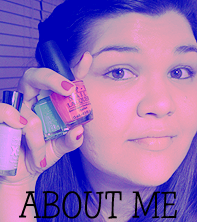 Naturally, I grabbed all the orange, black, and glitter polishes I have and started brainstorming. I knew I wanted to do an orange gradient so I chose Heat Flash by Sally Hansen Insta-Dri, In My Back Pocket by OPI, and The "It" Color by OPI, which made the perfect orange to yellow gradient. I wanted to throw in more black so I picked up Metallic 4 Life by OPI, an amazing silver glitter in a jelly black base, and opted for an accent nail. Over the gradient nails I sparingly put a layer of Clearly Spotted by Maybelline Color Show, which blended the gradient and made the glitter really pop! When it came to the stamping I was so indecisive. I have so many Halloween plates to chose from it was hard to decide what I wanted to do. 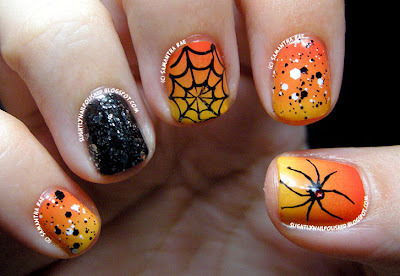 But after a long battle, I opted for a spider theme! So I stamped a creepy spider from Mash-38 and the spider web from Cheeky Jumbo Plate 6 "Happy Holidays" using Konad Special Polish in Black. And for good measure, I picked a piece of red glitter from a Christmas polish and made the spider a black widow! Eek! I absolutely love this design and I really hope you enjoy it too! Just a little tid-bit, this was a smash at work. Many people in my line asked me where I got my nails done and were amazed to hear that I did it myself. One lady even said I was in the wrong profession and should try doing nails full time. XD A major confidence booster if I do say so myself. WHOOT WHOOT! Web: Cheeky Jumbo Plate 6 "Happy Holidays"